Update 2018: Bamboo Beer Box is no more. Today, it is the restaurant Waves. It’s on the sand of a gorgeous beach. 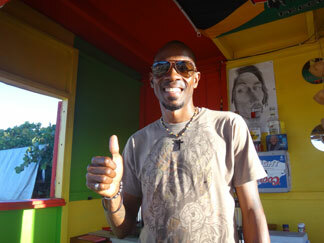 It is owned and operated by genuine, fun-loving, hospitable, happy Caribbean people. It is unpretentious and laid-back. 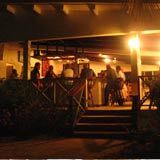 It offers delicious drinks and food. It’s a perfect blend of comfort and casual. It plays good Regional music. It is a place for almost everyone. 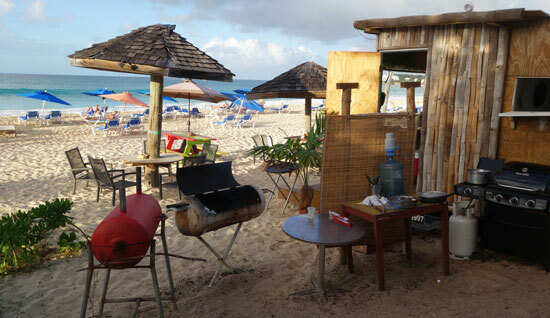 The Bamboo Beer Box bar is slightly elevated from the sand and offers tall bar stools for those who want to enjoy the fabulous company of Tuneero, who is behind the bar. 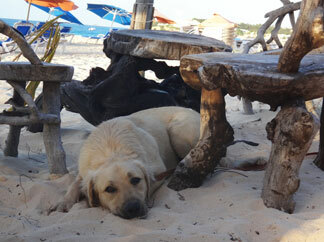 Wooden beach tables and benches rest under umbrellas for a little shade. They are all directly in the sand which is great for those who love to be barefoot or feel the sand between their toes. Fishie’s talents are seen throughout the Bamboo Beer Box. Fishie and Andy are the team behind the Bamboo Beer Box along with their right hand man, Tuneero. Between Fishie’s talents, Andy’s cooking and singing and Tuneero’s excellent service and their collective personalities, I’d challenge most to not be happy with an afternoon at the Bamboo Beer Box. The beach bar also features a platform stage that will eventually host morning yoga and in the afternoons and evenings, allows for live music. For those who haven’t caught Andy singing, stepping up on stage at Johnno’s from time to time, his soulful voice can give you chills. Today, Andy stays busy on the grill and in the kitchen, but in down time he’ll belt out some songs for his guests. Naturally I ordered the ribs in hopes of reliving the other taste vacations I’d had when eating food prepared by Andy. I was completely happy with my ribs meal from the Bamboo Beer Box. The meat was so tender it dropped off of the bone and the flavor was intense in a warm and fuzzy way without setting your mouth ablaze. If you are looking for unique and rich tasting ribs, you must try them. 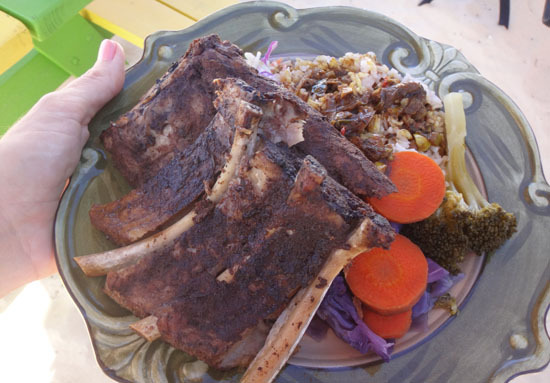 The ribs were served with rice and peas and steamed vegetables. All nicely cooked, and the rice had a bonus of an on-the-spicy-side compote on top that mimicked the rich flavor found with the ribs. I loved it but if you don't like any heat, perhaps you should ask for that to be omitted. 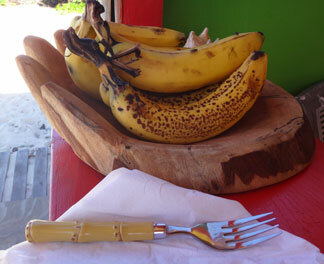 This meal felt like a treat, not just another Caribbean-style ribs and rice and peas plate. Andy’s genius cooking must come directly from his genes and having observed his grandmother in the kitchen in Barbados during his youth. Also on the menu is chicken and fish, curry goat and fries. They all come with the aforementioned accompaniments with chicken priced at $12, ribs $15, combo $18, curry goat $15, fries $3 and fish ranges (depending on size) from $22 to $25. Be sure to state whether you're eating there or taking your food to go since they use non-disposable items if you are eating there. 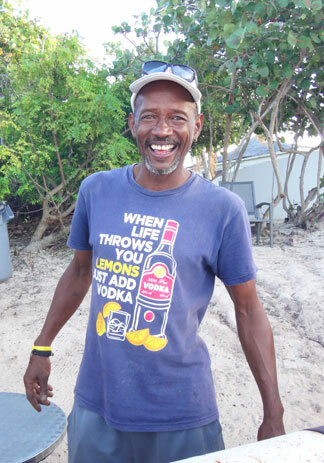 Given Anguilla and the greater Caribbean’s excessive use of disposable goods with a lack of recycling, this is important and it’s a nice touch. 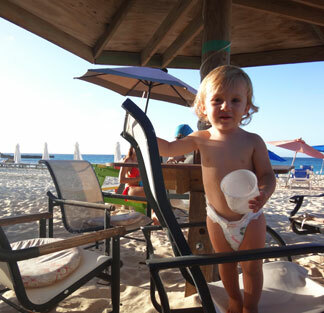 When you eat there, your plate will not blow away down the beach with the tradewinds after you’ve dug in. 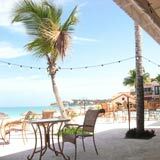 It’s a great spot for almost everyone who appreciates the beach, nice people and good food and drink. 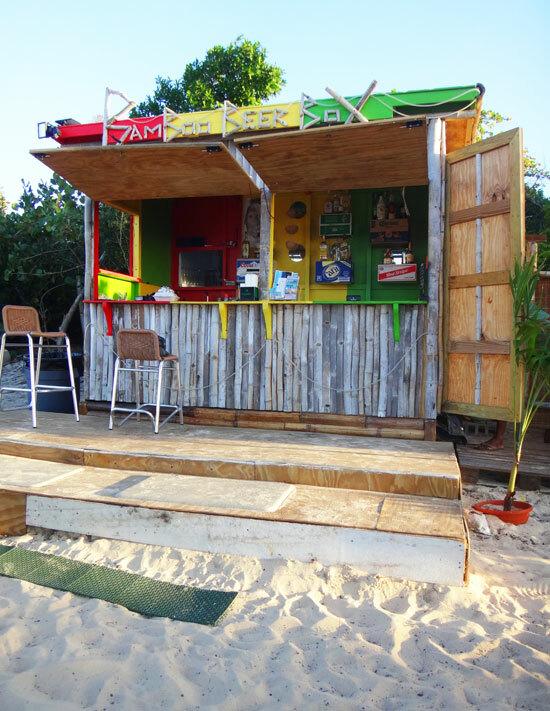 Bamboo Beer Box brings genuine Caribbean vibes to Meads Bay. Meads Bay is fabulous, from one end to the other and it has a nice variety already but there is nothing as casual and laid back as this new spot, the Bamboo Beer Box. 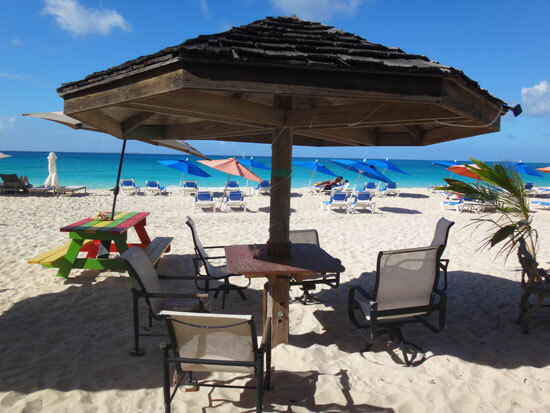 It’s a compliment to the western end of Meads Bay which is capped by the modern and upscale Viceroy. 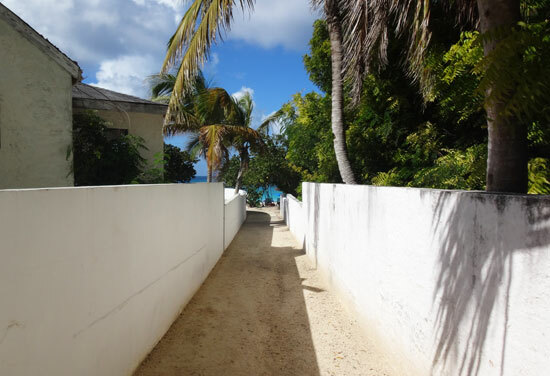 Directions: If you are staying on Meads Bay, you are in luck because you can walk. Keep in mind, if you’re staying at the lovely Carimar, it’s a little bit of a walk being at the opposite end of Meads Bay, so don’t forget your cash, hat and sunglasses. If you are coming from anywhere else on the island, the most direct option for driving to the Bamboo Beer Box will have you parking and walking no more than about 75 yards. 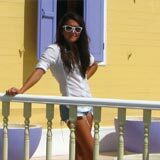 Drive towards Meads Bay (the western end entrance off of the main road) and follow the road to Sur La Plage. This road will have you bordering the well cared for Anacaona Boutique Hotel property. You can park along the road near Sur La Plage and then walk down the beach access walkway. When you reach the beach via that walkway, you’ve reached the back side of the Bamboo Beer Box (to the right). 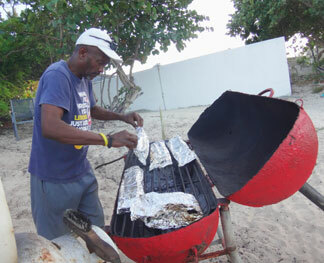 Hours: Hours of operation are similar to many Caribbean businesses, they are not set in stone. 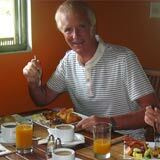 Late morning to until the last guest leaves tends to be the hours to now and on every day of the week except Monday. Keep in mind it’s more of a lunch spot and the food is prepared freshly each day so later in the evening, you may be able to get food but some menu items may be depleted for that day. 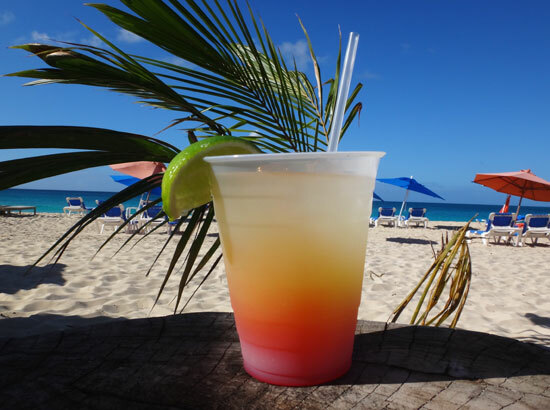 Whether you're new to Anguilla or a seasoned regular, the Bamboo Beer Box is not to be missed! 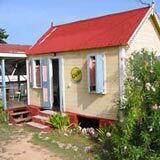 And if your staying on Meads Bay, you're in luck... this may just become your new, convenient spot.